As I've mentioned before, I've mostly used Hal Higdon's plans in the past. Although they've always gotten me to the start line, I haven't really felt prepared or challenged. This time around, I specifically looked for a sub 2 hour plan, and found one on Runner's World. This is a 10-week plan that is definitely more aggressive than what I've used in the past, but also has lots of variety that I think will keep my schedule interesting. I also used a running calculator to see what my training paces should be to hit that 2 hour half marathon. Some paces seemed completely achievable, while others (like the long run pace) were a lot faster than I'm used to running. I don't want to go into another race feeling unprepared and disappointed, so I'm putting it all in for this race! Here is a look at my training plan, along with training paces and explanation below. Feel free to give me any feedback (positive, negative, leave it all). Easy: There are at least two easy runs per week. These will be at a pace that feels easy for me, which is around 9:45. In the past, I haven't really focused on making runs "easy", and just ran them as any other training run. Now, I will focus on maintaining an easy pace (which some days will be slower than 9:45, but I'll make sure it's not faster) to make sure I'm really recovering. Long: My long runs are going to be at a faster pace than I'm used to running. Usually, I approach these runs as "just get them done". I've been reading a lot about getting over that 2 hour hump, and most articles suggest doing more miles closer to race pace. It makes sense- if I want to run 13 miles at a 9 minute pace, why am I running closer to 10:00 for long runs? I know that it's unreasonable to run HMP for all of my long run miles, so I'll be taking it down to a 9:10 pace as a goal, while trying to hit some miles at HMP. I've run one long run in for this cycle so far, and came in at 9:15 pace. I definitely could have gone a bit faster, so I think this is within my grasp! Thresold/Hard: There are a lot of fast finish/fairly fast runs in the plan as well. I'm going to take these as a threshold/hard pace of 8:30. For me, that pace is not super hard and fast, but not comfortable either. I may have to tweak this as I progress in this plan since I've never had runs like this in a schedule before! 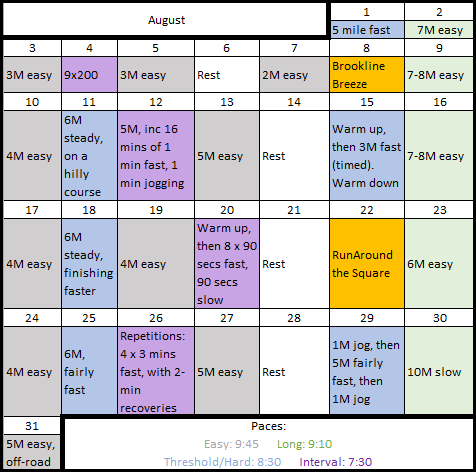 Intervals: This training plan has lots of different types of speedwork, which I found really interesting. Instead of having a distance on a track to run (such as 9x200 I have in the first week), most of the speedwork is done by time. I think this will be challenging, because I'm not trying to get to a distance as fast as possible. Instead, I have to maintain a certain speed (in this case, 7:30) for a set amount of time. Do you follow a specific plan or just wing it? I've heard that's a really great plan! If it works, why change! I'm hoping to finally find one plan that works for me. I am trying to pick a half marathon for either September or October. I have narrowed it down to two and will decide super soon. So hard figuring out sometimes what works in my schedule. Can't wait to hear what you choose! And yes, race planning is tough! "if I want to run 13 miles at a 9 minute pace, why am I running closer to 10:00 for long runs?" Because the best way to build endurance is by running long, easy runs. If you run your long runs faster you are limiting your body's ability to build endurance and, while you might run faster for the first half of the race, the lack of endurance will probably lead to slowing down towards the end of the race. This article is about marathon training, but it does a nice job explaining the physiological adaptations you need to make to build endurance (http://www.runnersworld.com/for-beginners-only/why-should-long-runs-be-slower). If it makes you feel better, when I ran my half pr (1:46, 8:06 avg pace), my training paces for long runs were 9:30-9:45. I think you already have more speed than endurance (your 5k earlier this year, 24:37, already predicts a 1:53 half, but your half PR falls short by 13 minutes). So if it were me, I would focus my training not on building speed, but trying to improve my endurance. You already have the leg speed required to run a sub 2, but not the endurance to hold that pace for all 13 miles. I also have a pretty huge gap between speed and endurance. Also if you look at the Jack Daniel's training paces, it specifies that your long runs should be done at your easy run pace, not at goal race pace. Also after a couple weeks my legs would be completely shot from running 2 runs at threshold pace, 1 interval workout, and a long run at race pace every week. For me that would basically guarantee injury. If you wanted to focus on getting in some half marathon pace runs, I would add a few miles at goal pace to the end of my long runs. So for an 8 mile run I might do 5 miles at easy pace and then the last three at HM pace. Thank you SO much for this, Heather! I really appreciate you always giving me your opinion and trying to help. I'll definitely take this into consideration when I start training. It makes perfect sense! I think the biggest problem for me is endurance and confidence. Most races I go in kind of scared and nervous, not thinking I have the ability to run a certain pace for 13 or 26 miles. I think it will definitely help to run some miles at my goal pace, but like you said slow it down to avoid injury. I struggle with confidence too. Sometimes just thinking about my long term goals makes me want to panic because I feel like I don't stand a chance at ever achieving them. Hopefully some goal pace miles during training will help you feel calm and confident on race day instead of scared and nervous. Also, I really glad to hear that my opinions come off as helpful and appreciated instead of bossy know-it-all. I definitely still have a lot to learn about running. But that is why I love blogging, it is a chance to learn from and connect with other runners. You know, I have never once used a training plan. I brought my marathon time down from 4:15 to 3:10. I've done ultras, went to Boston and all I did to get there? I just ran. And ran. And ran more. I never really did speedwork (other than Yasso 800s once in a blue moon). HOWEVER. I think I could have made better use of my time if I had done more quality workouts and less quantity. But, I never got injured. I've been running less miles lately and doing more track work, tempo runs, etc and it seems to be working fine for what I need in my life now. I just don't have the time to run 100 miles/week anymore! That's amazing Suzy! I wish I was that disciplined. If I don't have a schedule to follow I just don't stick to any mileage. I definitely work best when I have a goal number to hit each day. Maybe some day I'll be able to do it your way, but as of now that doesn't work for me! I'm excited for you to push yourself this training cycle! I think you will be shocked at how quickly your body will adapt. It will be very uncomfortable at first, but my favorite saying is "get comfortable being uncomfortable" and you will totally crush this race! : ) Happy Thursday! Thank you Jamie! My fingers are crossed that this works. I love that saying and will definitely use it from now on!! You know I love talking training plans so was excited to read this! I think switching things up with a new plan is a great idea, especially if you're tackling a big time goal. I love all the fast finishes is your plan. Heather's comment makes sense though. I do wonder if doing fast long runs every week is inviting injury, especially in light of all the other hard workouts on your plan. In addition to heather's suggestion to add mileage at race pace to some long runs, have you considered a long run at a moderate instead of easy pace? That's what my plan calls for, and that's defined as 1:00-1:30 minute/mile slower than race pace. ahhh loved reading this! i am kind of using the hal training plan right now but to be honest i think i would do better with something like this, especially because it tells me exactly what pace i need to run and stuff. i love the idea of speed training by time and not distance, i can see how that would be challenging and helpful :) good luck girl! you've so got this. It will definitely be more helpful for me to have a clear plan like this! I hope we can both reach our goal!! I've run quite a few (in my opinion, is 6 quite a few???) half marathons, and most under the 2:00 mark. I am learning more about my body and how I operate with each one. I've got #7 coming up in October & recently mixed & matched to make my own training plan. I've discovered that 3 days, or the occasional 4 days of running a week leaves me time to rest (I usually take 2 days a week off, though I usually end up still hiking or doing some yoga on those days) and time to cross train. If I run much more than that I just get burned out. I stop enjoying it and start dreading it. I like to keep 2 days off as it gives me time to jockey workouts around if things come up. So, most of my running is some sort of speed work during the week, a short to mid-distance run on Friday or Saturday, ideally the day before my long run, and a weekend long run. I like to spend my other 2 days biking & lifting weights. One of my favorite speed workouts is mile repeats, doing maybe 5 or so, at 10 - 30 seconds below race pace, with 400 - 800m rest. Not an exact science. But running a bit faster than race pace usually helps my goal pace feel like a breeze. Honestly, if I were you, I would substitute one of your easy runs with some cross training you enjoy. Thank you so much for commenting Jessie! I usually cross train twice a week, so it might be a good idea to take away one run to do that so that I still have one full rest day. I will definitely be tweaking my plan after all of these comments, so thank you for the suggestions!! I've ran a few sub 2 halves myself and I was all about this plan until I read the long run pace. Here I have to agree with the sentiment that it is a bit fast, especially given the rest of the runs in the week. I think if you made your easy and long run paces the same that plan would be great for you. Time on feet is pretty critical when training for the longer distance races. If anything what you could do (and something I have done in the past) is every couple of weeks run a few miles of your long run at race pace. Say, you have a 10 miler - run the last three building up to race pace. That will grant you the benefit of the slow easy miles that you need while also allowing you to practice a strong fast finish on tired legs. Don't take my word as gospel, though, this is just my opinion. I'm hardly an expert and still consider myself a running noob in many aspects. I learn new stuff all the time. It makes perfect sense. Funny how one "expert" suggests one thing and another "expert" will say the opposite! I'm happy to get a lot of feedback and luckily everyone is saying the same thing :) Definitely will scale down and take your advice. Thanks so much Nichole! Thanks so much for your feedback! You're such an amazing runner and I'll definitely be taking your advice :) I love that quote from your coach, and it's definitely something I'll work on! Aren't training plans confusing? They are all over the place. Run more, run less, run slow, run fast. I guess the key would be to find something you are comfortable with and that will give you the confidence you need on race day. Good luck! This is great! I like how you're posting the times you're hitting too. Have you done any intervals yet? Do you find it tough to stay on pace/check your watch, etc? I like the idea of time intervals though vs distance intervals. 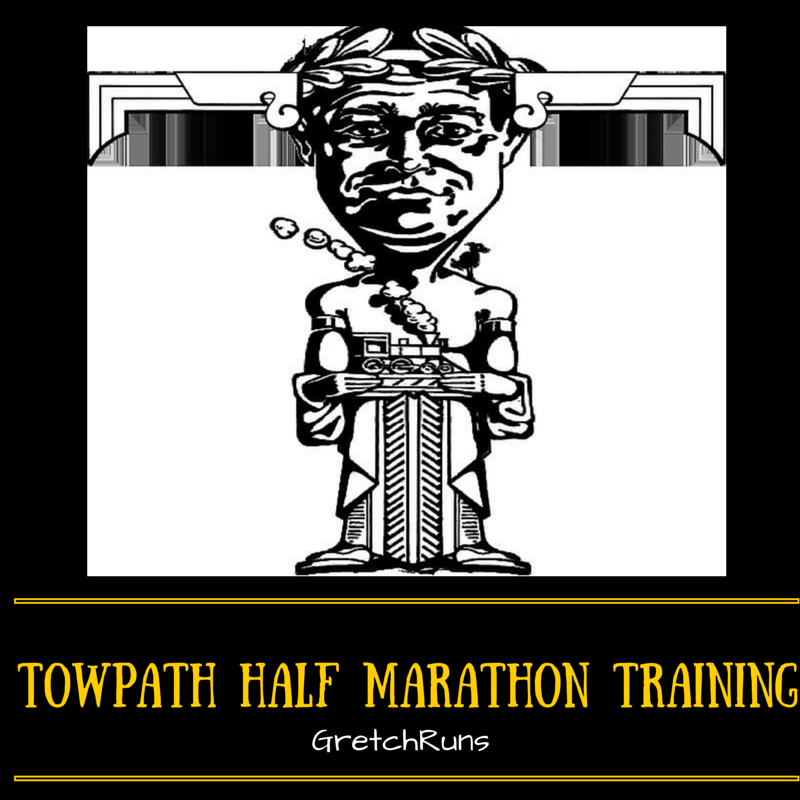 Also where is the towpath half? I've done a few speed workouts recently- 200s and 400s mostly. My pace has been pretty consistent in the 7:00 area which is good! I try not to look at my watch and just lap it after my intervals, which seems to work better for these quick intervals. For longer (800 or mile) I'll check my pace more often. The race is in ohio, a bit south of Cleveland! I'm late to the party (as usual), but I will agree with everyone - definitely slow your long runs down! I made the mistake of doing too many long runs at race pace or better when training for my first full and by the time I got to the start line, I was burned out. Keep your long runs at least 1 min/mile slower than race pace and every now and then add some fast finish miles in there.